When it comes to selecting the most appropriate position detection technology for an absolute rotary encoder application, it’s helpful to consider the general advantages and potential disadvantages of the two most common approaches: optical and magnetic. An array of photodetectors to convert the impulses of light into electrical signals. 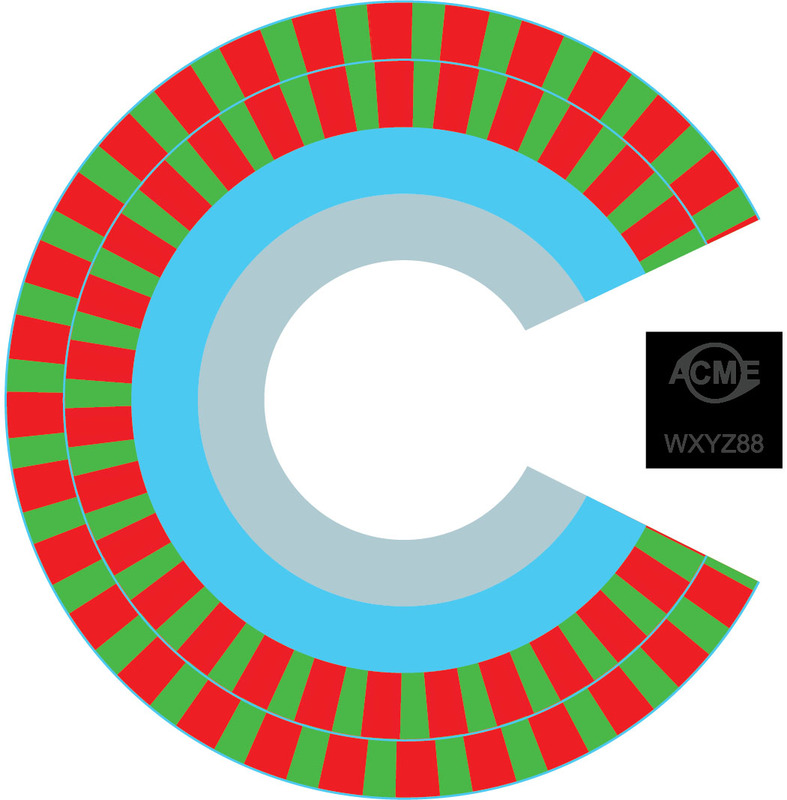 The spinning code disk contains a series of concentric tracks that each represent one bit of resolution, and each track is associated with a separate photodetector. Among optical encoders, there are two main variations: optical mask and optical phased-array. Optical mask encoders are the more straightforward implementation. A grated mask featuring slots of the same size as the slots in the optical disk is placed on top of the photodetectors to prevent the light spilling over from one channel to another. The chief advantage of the optical mask encoder rests in the ability of the encoder manufacturer to offer a variety of resolutions with the same photodetector array simply by changing the optical code disk and associated mask. On the downside, very high-resolution optical mask encoders require a very small air gap between the mask and the disk of about 0.001…0.003″ (25…75μm). Reliably maintaining such a tight gap requires tight manufacturing and assembly tolerances, and can lead to problems in severe shock and vibration environments. As a result of the limitations of optical mask encoders, phased-array encoders were developed. Rather than relying on only a single detector for each channel, an ASIC (application-specific integrated circuit) provides an array of very small photodetectors for each channel. The responses of these multiple detectors are averaged, producing a more robust detection signal that is less susceptible to variation than a single detector. This additional signal robustness can be used to relax mechanical construction and assembly constraints such as disk flatness, eccentricity, and misalignment. The end result is a wider air gap tolerance for phased-array encoders compared to the optical mask types. Both optical mask and phased-array detection schemes offer similar application advantages and disadvantages. They are immune to intense magnetic fields found around MRI machines or DC injection braking of AC induction motors. Due to the wider gap between disk and detectors, phased-array encoders are more tolerant of shock and vibration. Regardless whether optical mask or phased-array detection is employed, both variations are rather susceptible to environmental contamination. Particulates such as dirt, dust, or powders and liquids like water or oil can block or attenuate the optical signals, leading to output errors. Another environmental consideration is that elevated temperatures and temperature variations can accelerate LED aging, leading to reduced light output and less reliable signal detection over time. Absolute optical encoders are typically available with resolutions ranging from 10-bit (1024 pulses / 360°) to 22-bit (4,194,304 pulses / 360°). The magnetic disk employs a coding scheme called the Nonius principle, consisting of two concentric, adjacent tracks of alternating north and south magnetic poles. The number of poles on each track differs, typically by one pole. For example, the outer track may have 32 poles and the inner track 31. Going around the disk, there is a continuing shift of pole alignment between the inner and outer track. At any given position around the disk, the offset angle between inner and outer poles is unique. Two magnetic field sensors inside the ASIC each produce a sinusoidal signal in response to the north and south poles as they traverse over them. The phase shift between these two signals is unique for every position around the disk. Digital electronics convert this analog phase shift into a serial digital data value corresponding to the absolute rotary position of the disk around 360° of rotation. 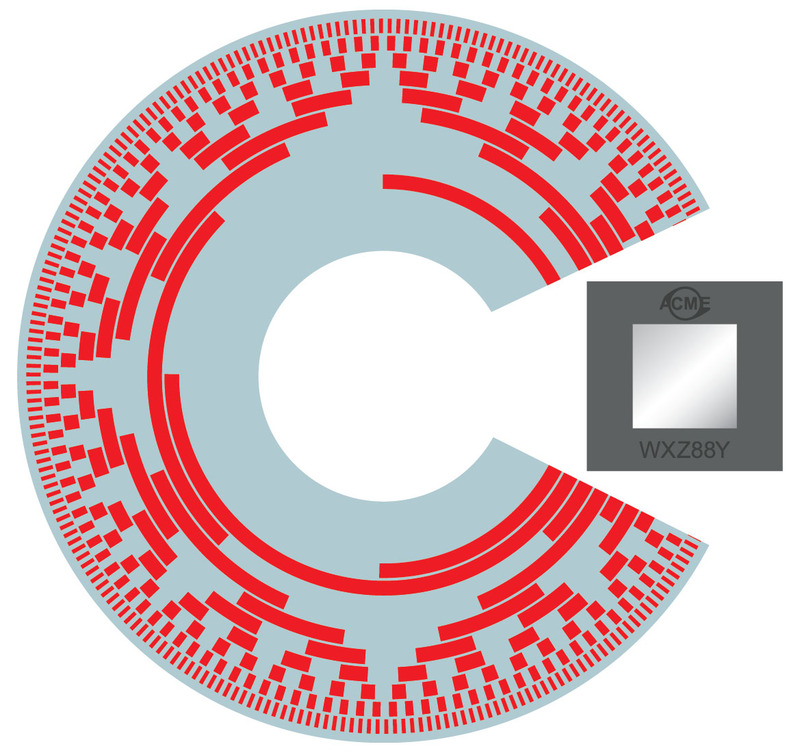 A great advantage of magnetic encoders is that the maximum gap between the sensing ASIC and the magnetic disk surface is larger than for optical mask encoders. A typical specification for a magnetic encoder gap would be 0.012″ ±0.008″ (0.33mm ±0.2mm), compared to an optical mask encoder requiring a gap of about 0.002″ ±0.001″ (50 μm ±25μm). Magnetic encoders are extremely robust. Virtually immune to shock and vibration, they are also impervious to many kinds of particulates and liquid contaminants, including non-magnetic (non-ferrous) metal shavings and powders. This ability to tolerate contamination largely reduces or eliminates the need for costly sealed enclosures. 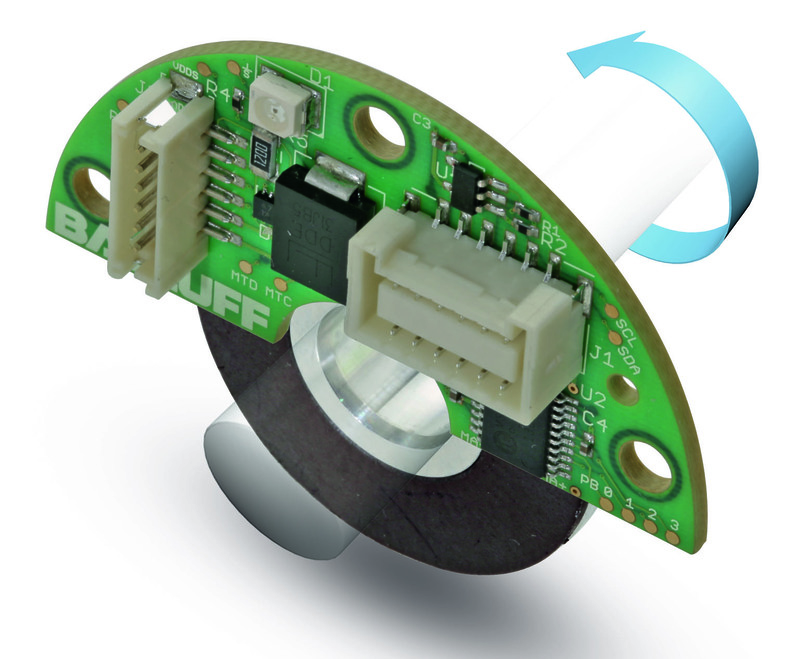 The primary caveats when applying a magnetic encoder are the presence of very strong magnetic fields that could disrupt the encoder’s operation and the presence of ferrous particles or dust that would be attracted to the magnetic surface, where they would potentially cause distortion of the magnetic poles. Although magnetic encoders don’t currently offer the highest levels of resolution available with some optical encoders, they do offer more than enough resolution for a wide range of applications. Absolute magnetic encoders are available with resolutions ranging from 12-bit (4096 pulses / 360°) to 17-bit (131,072 pulses / 360°). I am quite pleased to read these blog posts. Lots of useful information – thanks for providing it! Next PostNext If our products could talk, what would they say?